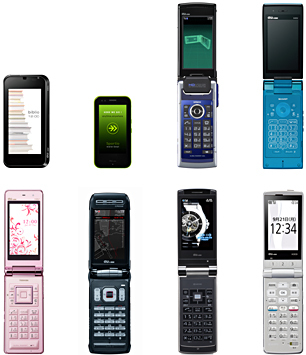 Rounding out the big three summer 2009 handset series launches, KDDI took the wraps off their new line-up here yesterday, announcing eight new models, with two devices coming from each Kyocera, Sharp and Toshiba while Hitachi and Casio each adding one more. 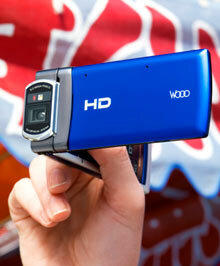 There are a couple main attention grabbers at first blush; the Solar Phone from Sharp, which packs a 5 mega-pixel camera and boasts waterproofing for the beach too boot, and the Hitachi HD Wooo claims to be the world first mobile phone with high-definition video, shooting 1280×720 pixels at 30fps and built-in HDMI Mini Connector for easy viewing on the big screen. The Run & Walk built-in fitness functions seem popular and the latest Casio G’zOne adds Beat Run along with improved compass and temperature sensors along with calorie counter and trip memory. Not be be outdone, the new Sharp Sportio can apparently play music even while submerged! The dedicated Flash Gallery is Here. Otherwise, the Biblio from Toshiba is tailored for eBooks, with 7GB storage, dual touch screen qwerty keyboard, WiFi, Opera 9.5 browser with full Flash and extensive dictionaries for those travelling on the Global Passport. carried about by a large capacity of 7GB. crystal that can enjoy "EZ book" to its maximum. Note 2) Resolution of 480×960 dots. Flash animation including more comfortable browsing and "YouTube ™". EZ"Ring song full plus ™"
Convenience, [entame], and foreign countries, etc. "Global passport GSM" in foreign countries and use it. in the best portability for sports accessories body and hand harmoniously. after it is safe, and moves. the water of about 12.5 /the minute from the distance of about 3m. golf, etc. has been enhanced. "Golf" of "au Smart Sports" and "GPS golf Nabis"
installed. It corresponds to Moreover, the function of "Pedometer"
amount of the life activity is shown. metabolizing" to show strength of the movement regardless. because it is equipped with wallet cellular phone (R). and AF and program AE, etc. is installed. high-definition images of which it takes a picture equipped with. use it". "3WAY opening style"
to use it by the best style for the movie taking a picture. instruments to be vivid and an exact, delicate finish was achieved. the making a passage destination has been installed. function. Battery [mochi] needs and regarded advanced model. because of the sunlight of (note 13). use style to demanded high battery [mochi] such as "Eco-charge"
equipped with the waterproof function, too. Sports Fitness･Golf" equipped with "GPS golf Nabis". steps of every day and manages is installed. that shines in the showing outdoor, and the entertainment is adopted. telephone and E-mail, etc. are possible even by foreign countries. elegant color variation produce Zain of ..cosmetic.. [de]. and it enjoy "LISMO Video" and the One Seg image comfortably. cellular phone (R) and electronic dictionary, etc. The toughness performance supports sports & outdoor life. ..preparing.. turn of the carbon in a sub-display surroundings. "Run&Walk" synchronizes with the motion sensor. dance steps to the music. temperature can be registered, and two functions of "TRIP MEMORY"
cellular phones (R) and "LISMO Video". Japanese pampas grass body of 10.9mm. genre like sports etc. is installed. the scene usually to use. brings those convenient functions together from a usual menu in addition. shutting" has been enhanced, too. phone" that pursues easiness to use further. clearly hears its voice by the noise cancellation with a double mike. Easiness to use/easiness to push has been considered. voice recognition, etc. has been enhanced because of light, too. "Voice reading out" that reads out "Voice recognition"
health care is firmly supported equipped with "Pedometer".